I assume everybody has printed something somewhere at some point. Now some of you, I imagine, have attempted to print on something that wasn't exactly 8.5 x 11 and that is never, ever easy or fun. The fine people over at Canon have felt the pain of hundreds of thousands of pieces of paper getting fed backwards, crumpling jamming paper, and printing on the wrong half of a document. Back in 2002 Canon released the CP-100 in an effort to ease our inkjet printers from our own stupidity and actually make it easy to print a postcard sized image on a glossy piece of paper. 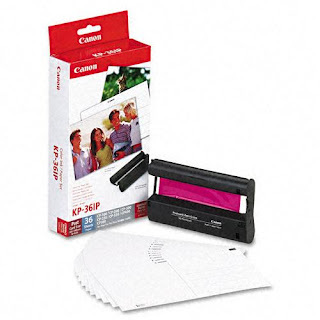 Along with the new consumer dye sublimation printer, Canon started selling the KP-36IP to easily supply their end users with a replacement Ink Cartridge and Paper. Canon has been selling the KP-36IP for many years now with minimal changes, and it will work in your vintage CP-100 as well as in your shiny SELPHY CP800. Because it is a dye sublimation ink cartridge, it contains exactly enough ink to print 36 photos and contains exactly 36 pieces of paper. If you are used to inkjet printers, you know you can make your ink cartridges last longer if you print things that are smaller or use fewer colors, but the same doesn't go for dye sublimation cartridges. They operate in a manner similar to the old ribbon in a typewriter or dot matrix printer. Once you print from particular piece of ribbon from the cartridge you can't reuse it. Just like those old typewriters, you can technically reuse the ribbon on a dye sublimation printer. You'll have no guarantee that the color you want will be where you need it when you need it, but it is technically possible possible to reuse a a dye sublimation cartridge as long as you can find a way to rewind the ribbon. 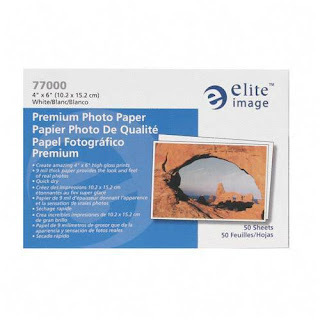 You'll need some additional photo paper if you are going to try it, but I'll guarantee you right now, that any other paper isn't going to be the exact weight as the Canon paper that we all know will work.